It's that they love each other. 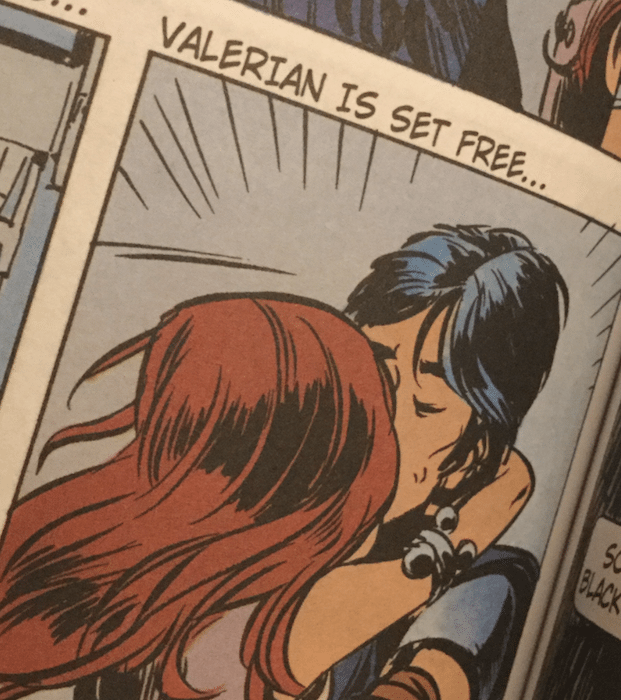 Valérian and Laureline is a french-language comic, originally published over six decades (the late 1960s through the first ten years of the 21st century), and in English currently by Cinebook. They put out single-volume books as well as bonanza compendiums; I've only, so far, read three of the former. It’s that they love each other. 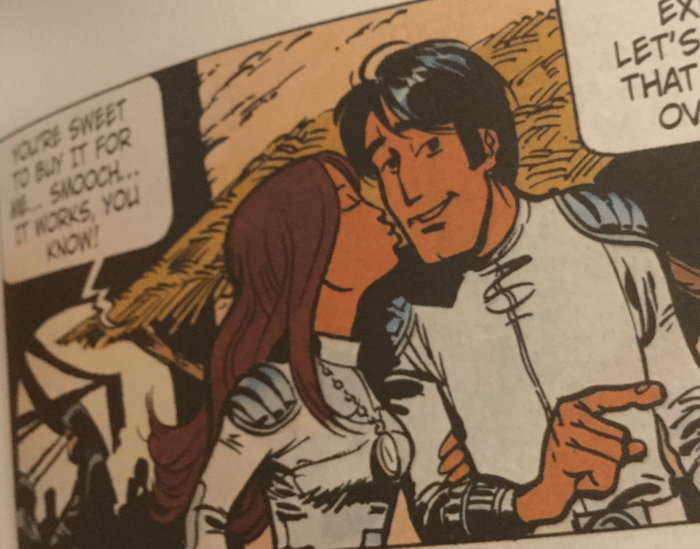 Valérian and Laureline is a french-language comic, originally published over six decades (the late 1960s through the first ten years of the 21st century), and in English currently by Cinebook. They put out single-volume books as well as bonanza compendiums; I’ve only, so far, read three of the former. But three was enough— enough to notice the beauty in the body language. These kids are cute. 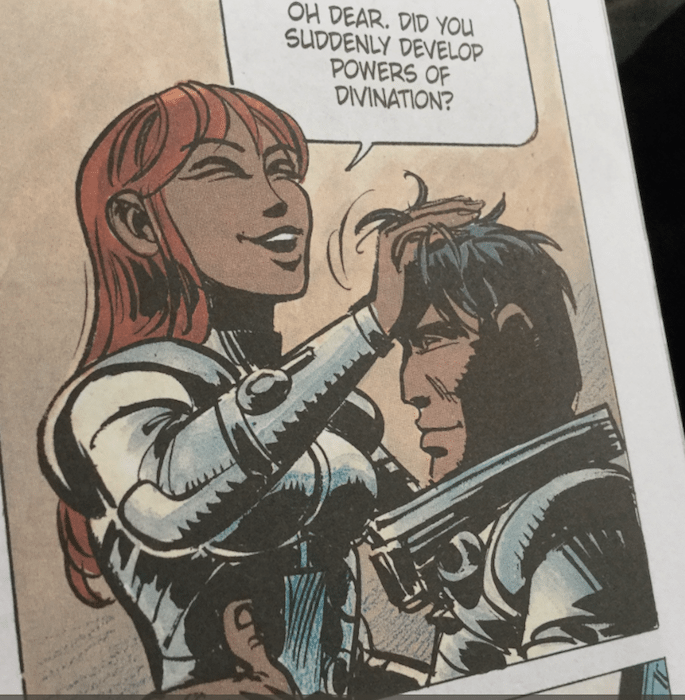 Laureline and Valérian are space-travelling “spatio-temporal agents,” whizzing in and out of the nth dimension, getting in japes and scrapes and making friends and foes throughout the galaxies. You may have seen their Besson-directed cinematic debut this summer; of course, on the other hand, like myself, you may not. That’s neither here nor there. I mention it only because the trailer (which I did see) made such absolute nothing of the element that, in reading, I like the best: the affection between its leads. Are they lovers, officially? What is the legal definition of their longstanding partnership? I don’t know. I don’t know! But it doesn’t matter, because it’s not a comic about words for romance or sweetness. It’s a comic about adventure. 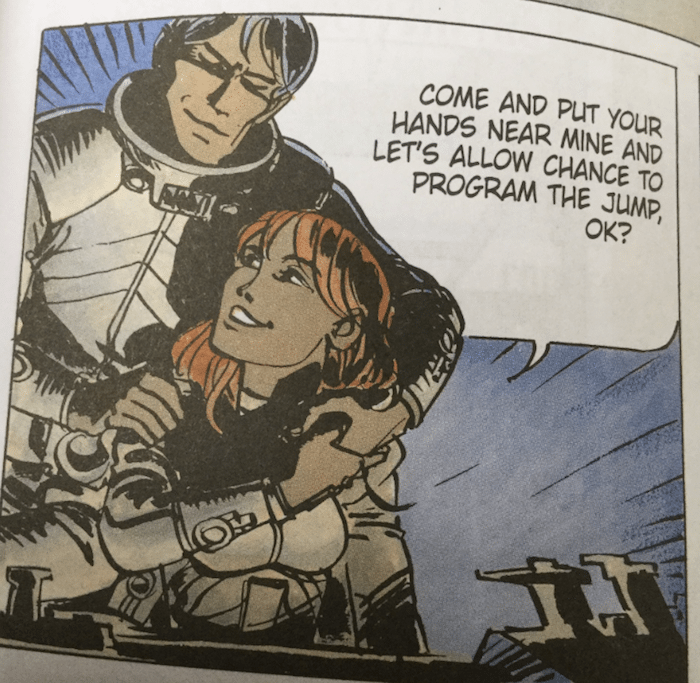 Valérian and Laureline adventure, together. They love each other. We know because we can see. When a girl and a boy adventure together I assume from experience a Modesty Blaise-Willie Garvin template: a boy and a girl who aren’t “like that,” as in, who don’t bone down. 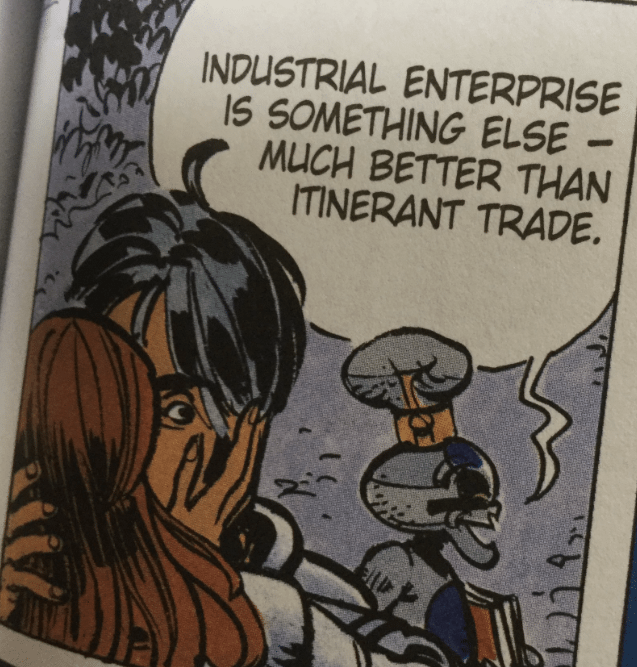 “Just Good Friends.” An example from the space-opera genre Valerian and Laureline shares is Cobra, where the human male protagonist lives with a woman he’s very fond of and very dear to but with whom he is such a sexual mismatch she’s literally made of metal with no apparent “apparatus.” I assume from experience as a reader but as well I assume from experience as a reader-around— sequential storytellers in english-language media have gone on record numerous times decrying the so-called Moonlighting problem (think back to the discourse surrounding the deletion of Spider-Man’s own marriage) — the idea that a couple (a romantically entwined duo) is a less dynamic screen or page pair than a non-couple. 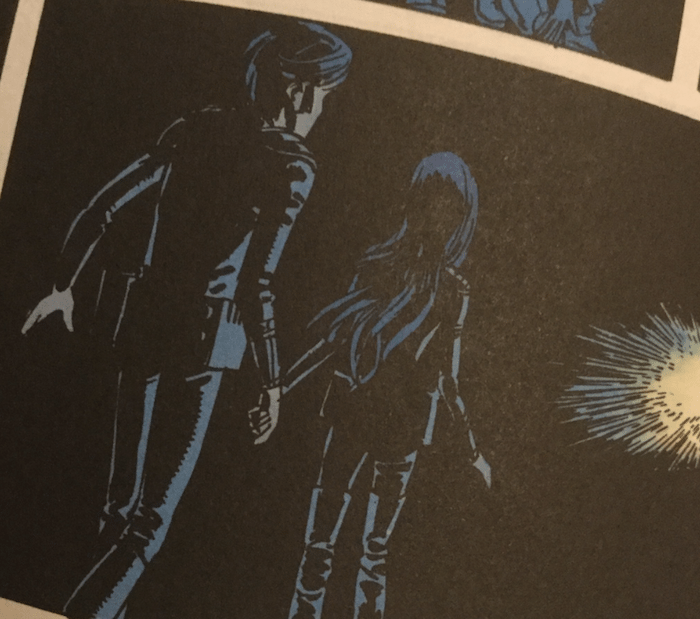 So I didn’t expect V and L to hold hands. I didn’t expect them to kiss. I didn’t expect them to climb on each other or address their intimate contact head-on, without emotional lampshading, or to trust and rely on each other so physically without their narrative putting up walls between their psyches. But that’s what they do! And I love it so much! Stories about space become stories about intimacy almost by necessity; space is called “space,” its presence in the fiction is physical and psychological. Who’s on your ship? That’s probably the only person you absolutely know you’ll ever see again. I’m a big fan of romance and physical delight in fiction. 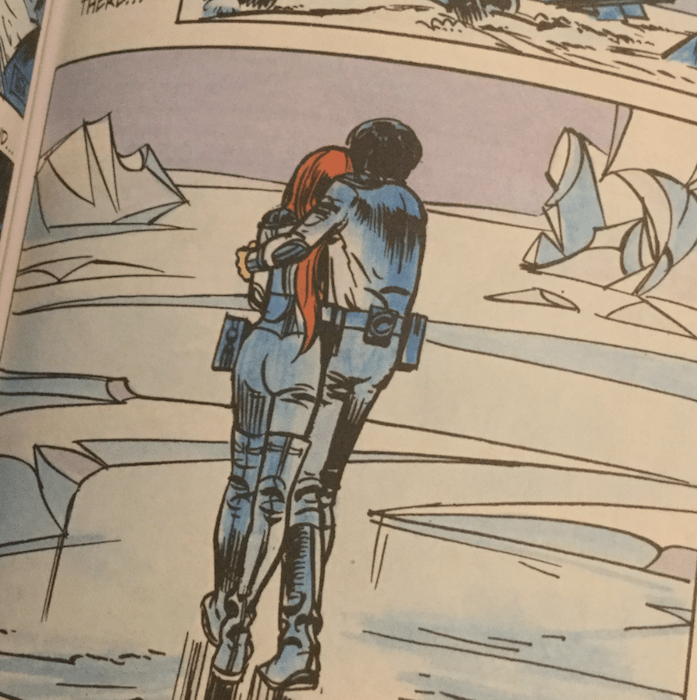 Even if I wasn’t, it still feels like Valerian and Laureline stands out among English-language comics and even manga examples of space fiction by placing a tangibly attracted and diplomatically settled couple at the centre of a star trek/star war/space western/etc. And by having their petting, by my experience, often show up as not titillation for audience but comfort for character. Moments of fear, moments of nerves, moments of anxiety: a ruffle of the hair, a hand held, a hug. The times when we need to be touched, placed cathartically on the page. Placed, with great care for balance, between feats of derring-do and extreme, canny achievement. Jean-Claude Mézières is a fantastic, influential artist (see again: the Star Wars) of costume, landscape and alien nature. But his knack for illustrating casual contact shouldn’t be understated! Pierre Christin is celebrated for various large-scale themes, but his attention to intimate detail likewise shouldn’t go unnoticed. 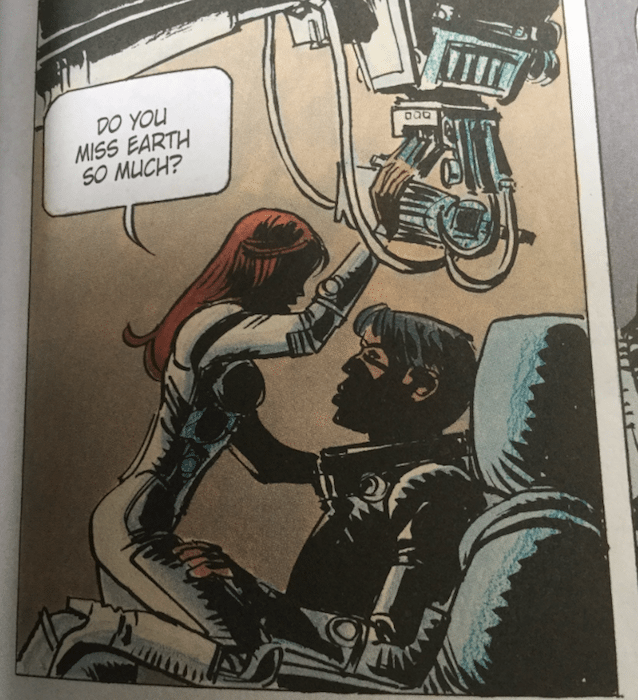 Valerian and Laureline volumes feel good to read in ways I didn’t anticipate, because fondness and the handsy goodwill of one’s partner empower in ways more pleasant than the wielding of a ray gun.